Table of Contents Next: Barrett, Charles D.
Dimensions 49'2" by 40'3" by 15'1"
1 1640 hp (1223 kW) Merlin 32 driving a 4-blade Rotol airscrew. The Mk.I had a less powerful Merlin 30 engine. The Mk.III had ASV radar. There was no Mk.IV and the Mk.V was not ready before the war ended. 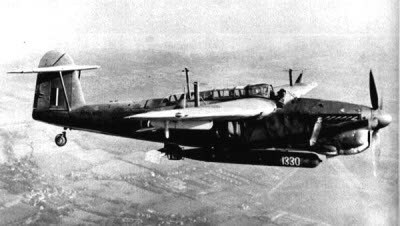 The Fairey Barracuda was a carrier dive and torpedo bomber whose design dated from 1937. Its development was delayed by the failure of the Rolls-Royce Exe engine program and then by the priority given to the Fulmar. The prototype finally flew on 7 December 1940. The elevated tailplane was adopted to solve a problem with the turbulence from the dive brakes under the wings. The original Merlin 30 was replaced with a more powerful Merlin 32. Deliveries of production aircraft began in January 1943. The aircraft was considerably more capable than the Albacore it replaced. The first British monoplane carrier torpedo bomber, it was rather maneuverable but badly underpowered. A force of 42 Barracudas scored 15 bomb hits on Tirpitz for the loss of two aircraft.